In some ways, it’s as simple as it sounds: a vertical farm is a multi-story greenhouse where fruit and vegetables are grown in stacked up towers. There’s obviously a lot more to it than that – and here’s where we’ll try not to blind you with science. The techy term for it all is hydroponics, which is a technique for growing produce without soil. Seeds are planted in a sterile, soil-less growing environment and then grown in nutrient-rich water. Water is recycled, and everything from air and water temperature through to humidity and lighting are controlled to create the perfect growing environment. Vertical farms can grow non-native produce in locations where traditional agricultural methods are impossible. Also, there’s no exposure to the hazards of traditional farming, such as bugs, diseases, pesticides and weather. Vertical farming is the practice of producing food vertically in stacked layers, vertically inclined surfaces, and/or integrated in other structures. It uses a combination of indoor farming techniques and controlled-environment agriculture (CEA) technology. 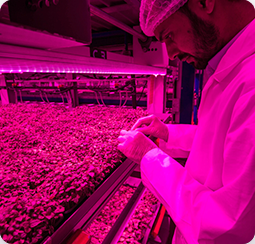 Vertical farms such as Badia Farms control environmental factors such as humidity temperature and gases, use artificial sources of light, and apply fertigation systems. Looking ahead, new methods of vertical farming are being researched and developed – and we will constantly adapt to the changes in technology. 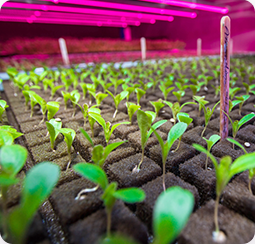 Our vertical farming methods use 90% percent less water than open field growing. On average, the gourmet product travels 3,000 miles to reach the finest restaurants in Dubai. The UAE currently imports more than 80% percent of its food requirement, the majority of which are vegetables. Agriculture represents around 70% of water consumption in most of the GCC countries. More than 90% of the land in the region isn’t suitable for agriculture. Domestic water consumption in the GCC is some of the highest in the world. 80% of Saudi water resources go to agriculture, while the sector only contributes 2% to GDP. Saudi Arabia is the largest producer of desalinated water in the world, producing 1.3 billion cubic meters of desalinated water in 2015. Saudi Arabia water availability has been steadily declining from 550 cubic meters per person in 1962 to 76 cubic meters in 2014 – among the lowest in the world.